a comprehensive wiki, useful collaboration tools, and much more. 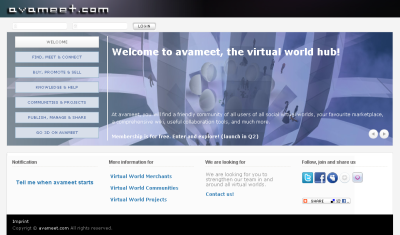 avameet is your place to stay in touch with your friends all over virtual worlds, to meet new interesting people, and to join groups and inworld projects. Settle down in your favourite virtual world community, and reach out to users of different virtual worlds. Goods and services for many different virtual worlds are traded in the avameet marketplace, and there is a special and unique feature to your marketplace to be announced soon. The avameet wiki for virtual worlds is a comprehensive competence and information center built up by and for users of all virtual worlds. Start your own inworld project and be master of your own group! Represent your university, organization, or corporation at avameet! At avameet you can publish and share your inworld and real world pictures and videos, announce your events, manage your projects, and use various channels to communicate with all worlds. Use avameet as your central gateway to all virtual worlds. Participate in 3D projects. Widen your horizon on the variety of virtual worlds." avameet.com was founded by Silvio Remus (Silvio Interflug in Second Life) who opened slinside.com in 2007, a very successful, but more SL focussed and mostly German portal. BERLINin3D.com and slinside.com have a long tradition in working together: we organized a lot of inworld and real life parties and events. Just some days ago, Linden Lab´s CEO Mark Kingdon(M Linden) announced, they bought Avatars United, a quite simliar project from Sweden. 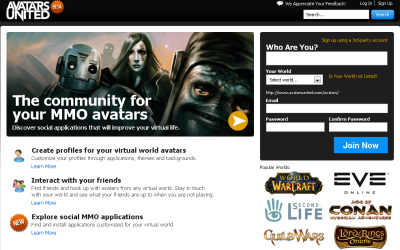 "The community for your MMO avatars. Discover social applications that will improve your virtual life. Customize your profiles through applications, themes and backgrounds. Interact with your friends. Find friends and hook up with avatars from any virtual world. Stay in touch with your world and see what your friends are up to when you are not playing. Explore social MMO applications.Find and install applications customized for your virtual world." See also Myrl.com, launched already in April 2008. "Myrl is a social gateway for virtual worlds that allows you to share your virtual life on the web. Discover, browse and play across multiple worlds with Myrl. There are quite a lot of others existing since years, e.g. koinup (foccussed on vid/pic sharing), allvatar (MMORPG orientated) or slprofiles. A relatively new one seems to be linkedprim, mainly foccussing on "Freebies" for Second Life.